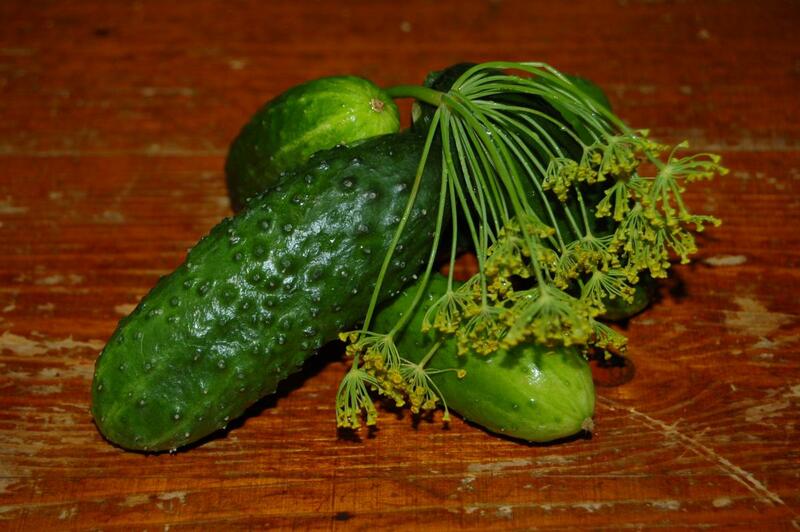 Fermented or brined products, such as dill cucumbers, cure for several weeks. Curing changes the color, flavor and texture of the product. Lactic acid produced during fermentation helps preserve the product. Satisfactory products can be obtained only when quality ingredients are used and proper procedures followed. Correct proportions of vegetables, salt, vinegar and spices are essential. Cucumbers—Select fresh, firm unwaxed cucumbers about 4 inches long. Cucumbers deteriorate rapidly, especially at room temperature. For best results, use varieties developed for pickling, pick early in the day, and use within 24 hours. Be sure to remove and discard a 1/16 inch slice from the blossom end of fresh cucumbers. Blossoms may contain an enzyme that causes excessive softening of pickles. Salt—Use non-iodized canning or pickling salt; iodine can prevent the bacterial fermentation and may darken pickles. Other salts contain anti-caking materials that can make the brine cloudy. Canning or pickling salt can be purchased at most supermarkets. Changing salt proportions or using a reduced-sodium salt substitute in fermented products is not recommended because the product will not ferment correctly. Vinegar—Use 5% acidity (50 grain) bottled vinegar. Do not use homemade vinegar or vinegar of unknown acidity in pickling. Spices—Use fresh, whole spices for best flavor in pickles. Water—When brining pickles, hard water may interfere with the formation of acid and prevent pickles from properly curing. To soften hard water, boil it for 15 minutes and let sit for 24 hours, covered. Remove any scum that is formed. Pour slowly to avoid using sediment that will be on the bottom of the container. The fermentation equipment must be washed in hot soapy water and rinsed well with very hot water before use. Suitable Containers—A 1-gallon container is needed for each 5 pounds of fresh vegetables. A 5-gallon stone crock is the ideal size for fermenting about 25 pounds of fresh cucumbers. Food-grade plastic and glass containers are excellent substitutes for stone crocks. Other 1 to 3 gallon, non-food grade plastic containers may be used if lined inside with a clean food-grade plastic bag. Be certain that foods contact only food-grade plastics. Do not use garbage bags, trash liners, or plastic buckets intended for non-food purposes. 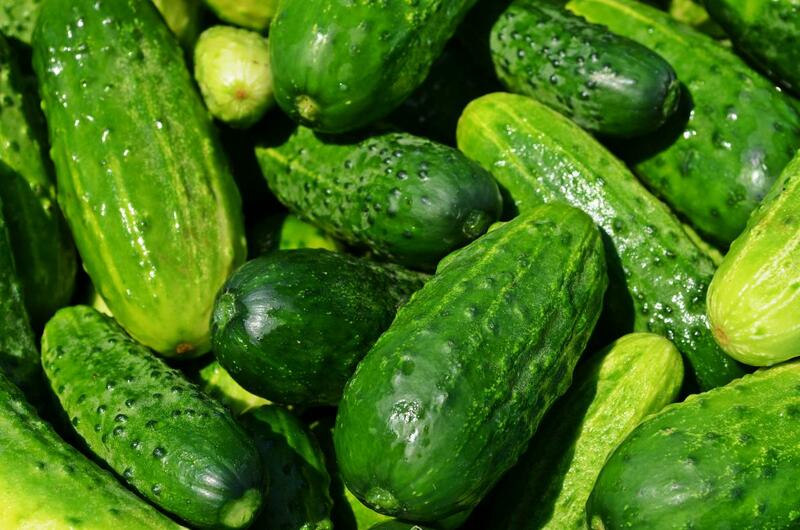 Covers and Weights—Cucumbers must be kept 1 to 2 inches under brine while fermenting. Insert a dinner plate or glass pie plate inside the fermentation container. The plate must be slightly smaller than the container opening, yet large enough to cover most of the cucumbers. To keep the plate under the brine, weigh it down with 2 to 3 sealed quart jars filled with water. Covering the container opening with a clean, heavy bath towel helps prevent contamination from insects and molds. The plate also can be weighted down with a large food-grade plastic bag filled with 3 quarts of water containing 4½ tablespoons of salt. Be sure to seal the plastic bag. Freezer bags sold for packaging turkeys are suitable for use with the 5 gallon containers. Scales and Utensils—Household or food scales will be needed if the recipe specifies ingredients by weight. When heating pickling liquids, use unchipped enamelware, stainless steel, aluminum, or glass utensils. Other metals may cause undesirable color changes in the pickles or form undesirable compounds. One or more of the following optional ingredients: 2 cloves garlic, 2 dried red peppers, 2 teaspoons whole mixed pickling spices. Wash cucumbers. Remove blossom end and discard, leaving ¼ inch of stem attached. Place half the dill and spices on bottom of a clean, suitable container. Add cucumbers, remaining dill, and spices. Dissolve salt in vinegar and water, and pour over cucumbers. Add suitable cover and weight. Ferment pickles. Check the container several times a week and promptly remove surface scum or mold. If the pickles become soft, slimy, or develop a disagreeable odor, discard them. 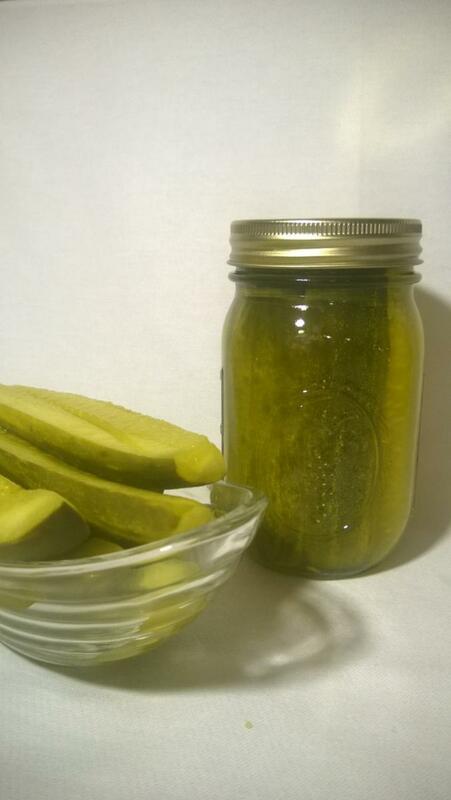 Fully fermented pickles may be stored for about 4 to 6 months in the refrigerator. Canning fully fermented pickles is the optimal way to store them. To can them, pour the brine into a pan, heat slowly to a boil, and simmer 5 minutes. Filter brine through paper coffee filters to reduce cloudiness, if desired. Fill hot jars with pickles and hot brine, leaving ½-inch headspace. Remove air bubbles and wipe jar rims. Adjust lids and process as shown on table, or use the low-temperature pasteurization treatment. Raw Pints 10 min. 15 min. This treatment results in a better product texture but must be carefully managed to avoid possible spoilage. Place jars in a canner filled halfway with warm (120 degrees Fahrenheit to 140 degrees Fahrenheit) water. Add hot water to a level 1 inch above jars. Heat the water enough to maintain 180 to 185 degrees Fahrenheit water temperature for 30 minutes. Check with a food thermometer to be certain that the water temperature is at least 180 degrees Fahrenheit during the entire 30 minutes. Temperatures higher than 185 degrees Fahrenheit may cause unnecessary softening of pickles. Andress, E. and J. Harrison. So Easy to Preserve, 6th Ed. Athens: University of Georgia Cooperative Extension Service, 2014. Pickling Vegetables, PNW Publication 355. (2015). Oregon State University. Revised by LuAnn Duncan and Beth Gaydos, Extension Educators, 2008. Information Compiled by Marcia Jess, Extension Educator, Family and Consumer Sciences.